Author/Opus: This is the 128th puzzle from our contributing puzzlemaster Prasanna Seshadri. 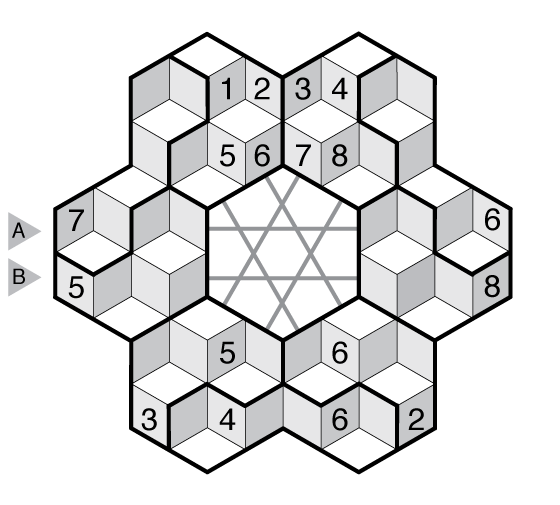 Rules: Standard Isodoku rules, using numbers 1-8. Answer String: Enter the 5th “row” from left to right, followed by a comma, followed by the 7th “row” from left to right. Note: Follow this link for other Isodoku. If you are new to this puzzle type, here are our easiest Isodoku to get started on. 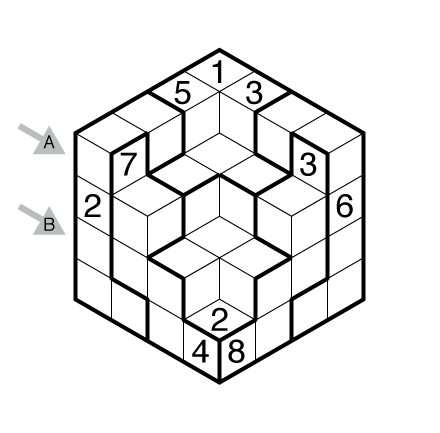 Author/Opus: This is the 127th puzzle from our contributing puzzlemaster Prasanna Seshadri. Author/Opus: This is the 98th puzzle from our contributing puzzlemaster Serkan Yürekli. 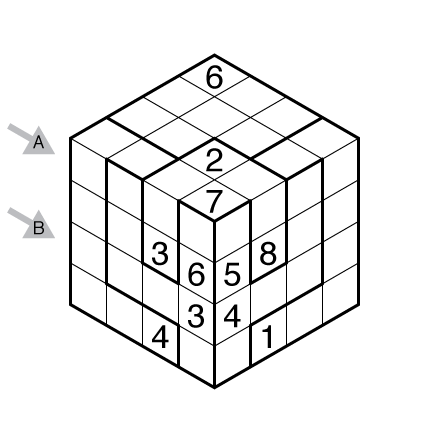 Author/Opus: This is the 1st puzzle from guest contributor Wei-Hwa Huang. Answer String: Enter the 1st “row” from left to right, followed by a comma, followed by the 8th “row” from left to right. Author/Opus: This is the 160th puzzle from Thomas Snyder aka Dr. Sudoku. 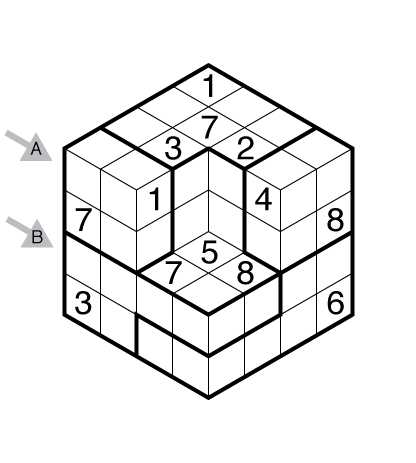 Answer String: Enter the 5th “row” from left to right, followed by a comma, followed by the 8th “row” from left to right. Two more from the US Sudoku Qualifying Test in May — both geometric departures from regular sudoku. As I consider the 2012 Irregular on the USSQT one of my best puzzles from that year, it was obviously going to be a challenge to do as well this time around. I felt the puzzle below was an adequate follow-up but certainly not as good as last year’s. The solve is meant to take advantage of the slightly irregular spacing of 1-6 in the patterned middle with the extra 7’s and 8’s giving a single solution. Note there are no 9s anywhere in the grid. Some Law of Leftovers steps will likely be encountered before the finish. 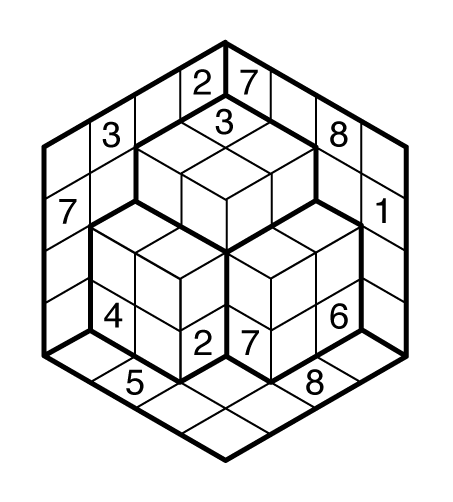 For the isodoku, just before the US Qualifier test, one of our readers here suggested I make a tutorial on some of the forced rules that come with these 3d shapes (this was after an isometric TomTom that strongly required solvers to know only 2 of each digit could appear on each face). I obviously couldn’t post such a tutorial just before the USSQT, but the properties of the 3D shapes was strongly in mind here. 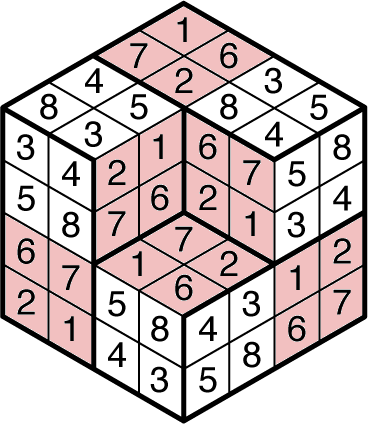 Often — like in the standard 2×4 rectangle form of an isodoku, or the 2012 USSQT Isodoku — there is a strong 2×2 square requirement that can split the digits into two distinct sets throughout the puzzle (see this colored solution of the 2012 for example). This year I wanted to choose a geometry that almost seems like it needs that 2×2 requirement in places, but here only three digits are highly constrained and the attempt to split the shape into patterns falls apart. 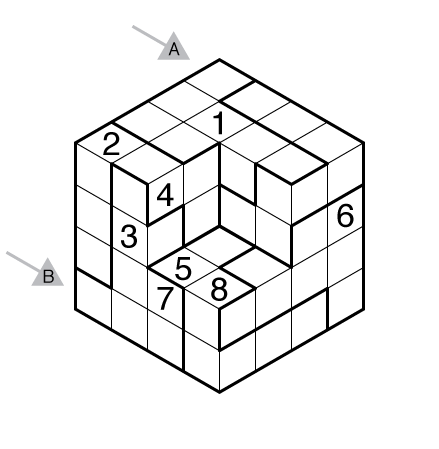 Can you spot the three constrained digits and sort out where they must always go in this kind of geometry? Six particular cells are key. Rules: Standard Sudoku rules. 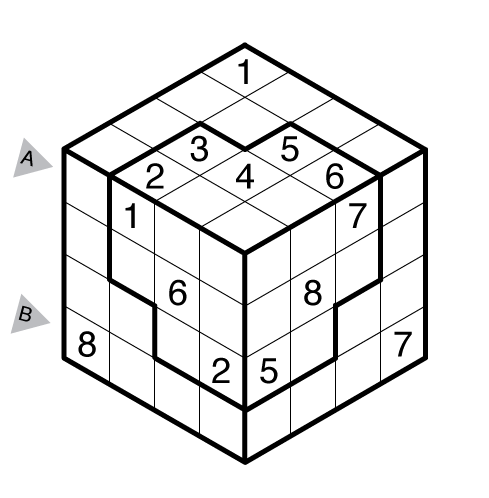 The regions are not 3×3 boxes but are instead irregular shapes indicated by the bold lines. Theme: Last snow of winter? This Snowflake Isodoku may not be the last snowflake to fall this winter, but it will be the last snow-based puzzle from us this year. 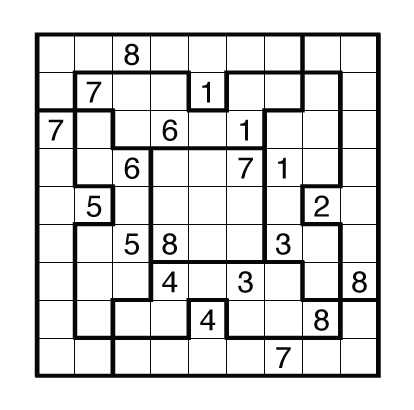 Rules: Standard Isodoku rules, using numbers 1-8. Some rows connect across the center of the shape by following the gray lines. Answer String: Enter the 1st “row” on the left edge, followed by a comma, followed by the 2nd “row” on the left edge.